I've been looking at the specs and reviews on this antenna, and I am impressed. and installed a 1" vertical tube (heavy wall aluminum). Have any of you guys installed this antenna? I'm interested in how it went. And will the brackets tighten down to 1 inch? Just got an email from DPD. I was advised that 1" mast is likely too small for a proper install. I'm looking into solutions now. I had to wait all day for the mailman to bring the new antenna. He got here late in the afternoon, just before the rain started! what I would have used, but it works pretty well. Just have to be careful not to over-tighten the U-bolts. (Don't crush the Radome). I decided to wrap the mast in some Gorilla tape, so the 1" mast would indent the tape and keep it lined up while I was installing it on top of the tower. The antenna came with a female N to male SMA, for connecting to the receiver. (It cost extra). It's installed at about 33 feet on my ham tower (now my TV & 1090 tower), using some old 9913 coax (installed around 1991). Even with old beat up coax, the dongle is getting really good signal levels. So strong that using my LNA (installed at the dongle) actually over-loads the dongle. I was able to use it before on all my DIY indoor antenna with good results. But can't use it with this DPD ant..
Maybe if it was mast-mounted.. I've seen some planes off the coast of NJ, 164 nm down south. I'm impressed. I can't wait to see the uptick in performance when new modern coax is driving a new high tech radio.. A Puck maybe? Learned a little about the DPD antenna 'install' today. I installed a switchable attenuator at dongle. I was curious to see what would happen if I cranked in -9dB of loss. That would subtract out the gain of the antenna. I turned off both AGCs in the dongle and used RTL1090 to observe signal levels. -3dB cuts the signal in 1/2, and (see chart below) was hardly noticeable. (RTL1090 doesn't display in dB)..
-6dB cuts the signal to about 1/4, but not a single plane 'fell' off the display. At -9dB, (about 1/8 the normal signal power) I started to see the signals drop down on the planes around Long Island. (170 km /95 nm). However, many of those planes didn't drop off the display. Just for kicks, I turned the attenuator all the way up to -20dB. (1/100 of the power). No planes inside 50 nm were lost. They started to thin out a little at 75 nm..
A. The transmitters on those planes are pretty powerful. B. The location of your antenna is very important. It works best, when it is up away from ground clutter, where it can 'see' the planes. Even a low gain ground-plane antenna will perform fairly well in this application, IF it's mounted up in the clear. I'm not saying that I don't need a high gain antenna here. The trees are still bare. Leaves love to absorb microwaves. As summer comes in, we'll be seeing a lot of signal loss to the north. (I know this from my 900 & 1295 MHz work using Ham TV). Today, I also connected the antenna to an ICOM R8500 radio to listen to 1090 MHz. Wasn't too impressed with the signal levels. But, I did see very strong signals in the frequencies below the ADS-B band. Very many, very strong signals in the 950 MHz down to the 450 MHz bands. The S-meter indicating 20dB over S-9 on much of them. at 450 to 950 MHz will likely cause front-end overloading of the Dongle. Causing it to de-sense as the AGC circuits are normally wide-band in nature. So, perhaps my busy RF environment calls for a 1090 MHz filter.?. Can not believe the winds around Boston today! I just heard a loud gust hit, then a loud thump and my wife call for help. I ran out back to see her hanging on to the BBQ grill. It had been blown into the deck rail.. That thing is heavy! Never expected hurricane-like winds today.. The forecast was for 22 mph..
As we worked to get in back upright and out of the wind, I looked up.. The DPD is now being tested in horizontal polarization mode..
Good luck with getting that upright again!!! The weather here is rotten.. Rain should be gone tomorrow, but the wind will still be too high. (I don't like to climb when it's above 15-20 mph). It's going to get a lot colder tomorrow too. (Being a Texan and almost 70, I don't tolerate cold very well). We may have to wait for summer weather to strike again! When I installed this last week, I didn't go crazy on the U-bolts, since I planned on re-torquing all the hardware when the new coax comes in. It should have been good for a couple of months, but Murphy's weather law prevailed. I was amazed that our 126 pound BBQ grill actually blew right over. The wind was from the south, and the grill was on the north side of the house! Err yes - wouldn't catch me up a ladder or tower in anything above a light breeze!! Hope the BBQ survived - and that you get to use it soon!! Right after noon tomorrow, the sun will be out and the wind is predicted to drop down to 18 mph. So, my plan is climb up there, clip some cable ties and slide the boom over and straighten up that antenna. Planes coming in on their final approach to KBOS suffer signal loss over the city of Lynn, just 7 miles from the airport. Before the windstorm pushed the antenna over, good tracking right down near the runway was common.. Seems my limited range data is being used this evening! I have this antenna with a Mode-S Beast, no amp or filter. I am not a radio enthusiast nor am I very knowledgeable about electronics. What I do know is that I have a very pronounced "doughnut" effect. I can receive planes well south of Long Island (200 miles out) and I live in northwestern CT. I cannot, however, receive flights within a 25 mile or so radius of my house (this includes BDL airport) below FL300 or so, with the exception of occasional low-level (4800' down to 2250') planes to the SSE on final approach to BDL that are only 10 miles away, even though terrain is in the way of line of sight to those flights. Can anybody recommend a hardware solution (including possibly a different antenna) that would trade my long distance reception for better close-in reception? My long distance coverage is already well covered by other ground stations, however take-offs and landings to BDL are right by my house with line of sight, usually under 4,000' and within 4 horizontal miles. BDL really needs my coverage. There is a Verizon cell tower 3000' away from my house to the north, but I do not believe it interferes because I do receive flights 30 miles to the north. The simpler the solution the better. I have to communicate my needs to the great folks at Pinkfroot. I'm very familiar with the flattened doughnut shape pattern of vertically polarized gain antennas. whenever a plane flew directly over me.. But, maybe only if the plane was at very high altitude.?. Besides the main gain lobes, there are other characteristic that most gain antennas have. One is called Side Lobes and another is called the Near Field. So, when a plane gets into your near field, or a side lobe you will still hear it's signal. It will be weaker, but it will still be above the normal noise floor. My DPD antenna can hear planes that are directly above my house at 40,000 feet..
And, the aircraft's antenna is likely a vertically polarized with a big doughnut null sitting on top of my house!! But, since the plane is only 7.6 miles above me, it's still in my near field..
And, the 1090 signals from the planes are quite powerful.. It seems logical that if a plane got twice as far away, it would have 1/2 it's normal signal.. But that isn't the case.. It's worse! Radio waves are subjected to the inverse square law..
"intensity is inversely proportional to the square of the distance from the source"
If a plane is nearby, and in line of sight.. You should be able to hear it. I've inserted up to 40 dB of loss (using attenuators) and still picked up the local aircraft..
See chart above, 40 dB is a LOT of loss.. I live in an area where there is a lot of strong RF signals. Plus, I'm using an LNA (Pre-amp). So, I have a filter to keep my wide-band dongle from being over-loaded.. I think your problem might be receive system sensitivity. Desense is typically caused by an off-channel signal that is sufficently powerful that it causes the receiver to cut-back the gain (Automatic Gain Control, AGC) and thus you can't 'hear' the on-channel signal. At each subsequent RF or Intermediate Frequency (IF) stage, the bandwidth typically becomes narrower and narrower. The AGC loop must control the RF and IF gain closer to the front end (and thus the AGC circuit is exposed to a wider bandwidths than the entire receiver end-to-end). Thus, an off-channel signal can affect the AGC, but you don't hear the off-channel signal because it isn't within the bandwidth of the whole chain. But the off-channel signal does cause the receiver to go deaf due to the action of the AGC. Another possible mechanism is saturation, but the AGC mechanism is more likely since it can occur at more reasonable amplitudes. Except with digital radios (those with DSP in the signal path) - they need lots of bits (bit depth) to accomodate weak signals accompanied by off-channel stronger signals - otherwise 'digital saturation'. 16 bits is usually inadequate for such application. that even a system that's working poorly will likely be able hear them.. But, at 150 miles, if it's not in the gain pattern of your antenna, you might not hear it at all..
From what I have been reading, saturation (likely due to the 9 dB gain of this antenna) is probably occurring with the close aircraft. Others have tried a 0 dB "Franklin" brand antenna and have better success with little loss of distant signals. I would like more feedback before going that route because many planes fly so very close to my house that it would be like setting up a receiver by an airport. So to reiterate, distant signals are picked up perfectly, while close signals are not. My computer setup is unlikely to be a significant source of Desense as the monitor is an LCD that I leave powered off, and there is nothing unusual that would set the computer apart from the thousands of other ADS-B feeder ground stations globally that can receive close by signals. The coax is high-end RG6 with sealed, high quality connections. IMO 9 dBi isn't a super high gain antenna. The first attenuation test I did was at 9dB. It cancelled out all the gain of the antenna and it still worked great! There wasn't any real noticeable change in reception at 1090 MHz..
At -40 dB, I could still track the local traffic.. -40 dB = 0.0001 power ratio. That means 1/10,000th of the original RF power was being passed to the radio..
-40 and +9 = a -31 dB gain antenna.. That really says a lot about the power being transmitted by the planes. And how good my LNA & Dongle are. That power is the reason that a tiny 3dbi antenna can hear a line-of-sight 1090 MHz signal at such great ranges.. It normally isn't your PC clocks that could cause desense. But it's possible that a other continuous strong off-band signals could be holding your AGC pegged..
You might be able to find out if there are any local strong signals by using a wide-tunable radio. Like a dongle. If you can 'see' the spectrum at 1090 MHz, it might help you find out what level and type of signals are present, or or near 1090.. 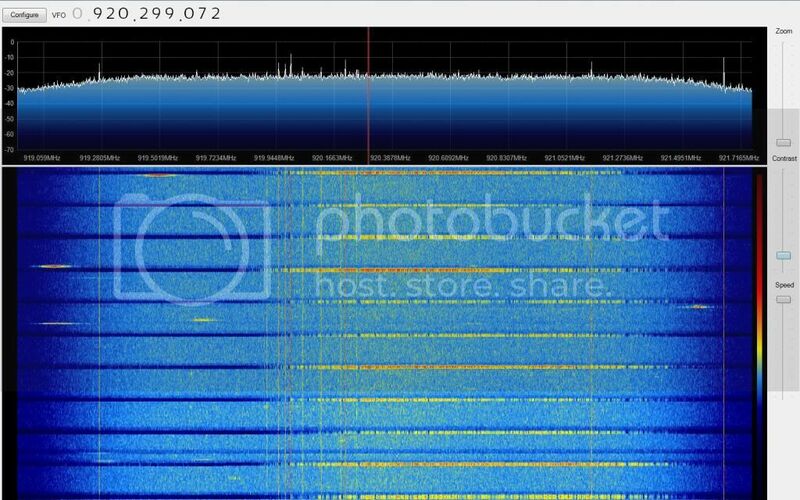 Here's some wide band signals I hear at my house. Once a second from the NStar power meter. One other source of problems that I didn't list before.. Is the antenna itself. If it was damaged internally, it might only have a gain of 0.8 dB.. It would still work somewhat, since the signals from planes is so strong.. When I got mine, there was damage to the box. Had me worried. I've had UPS break antennas in half before. The only way to tell if it's working correctly, is to compare it to a known-gain antenna. I gave it a quick test before installing. I could hear 1090 MHz signals in my basement, so I installed it.. If all I want to receive is the local traffic, would a 40 dB "attenuator" be a worthwhile item to insert inline? No, that might be too much loss. Depends on your receiver sensitivity/ selectivity etc. If you only wanted short range, just use an indoor antenna. Or very small 1/4 wave outdoor antenna. One of my indoor antennas was good up to 100 miles. But one that I made had much shorter range. I think my max range on the DPD, will be about 200 miles, after I get the new receiver and coax installed. The designer used an RF filter at 1090, and also built a neat method of detecting both weak and strong signal levels. And it seems like his testing proves that both weak and strong signals are being decoded properly.. If the radio is in good order, the antenna isn't over-powering it. I get planes passing nearly directly overhead from 800ft to 41,000ft.. No doughnut loss seen.. If it's nearby (or distant), and in your line-of-sight, you should be decoding it's signals.. 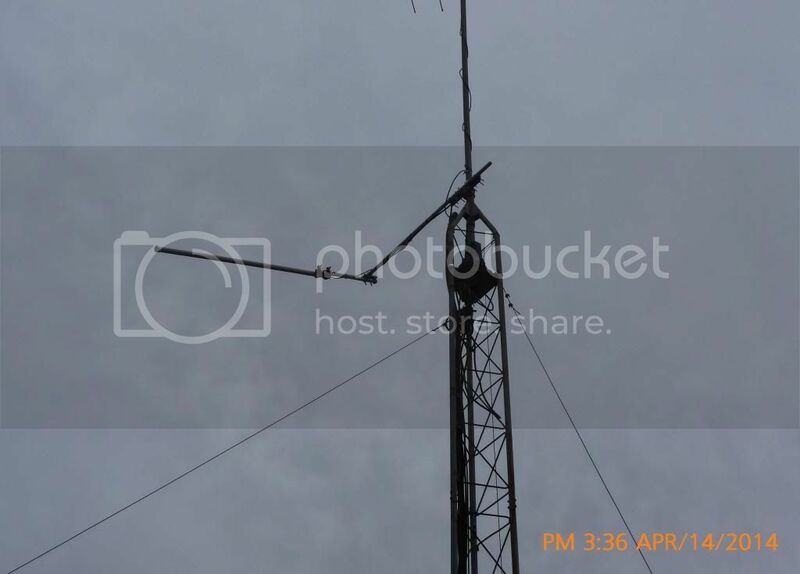 The antenna has been up and working since April 12, 2014 and working well. This weekend, the new coax was installed and the system (1090 Puck & BeagleBone Black) should be working at peak performance. Wow, that's amazing range! We need that coverage north of me, since the very tall trees to my north are killing the signals from Canada. It looks like you and I have a pretty good over-lap area. I had considered moving my DPD up to the top of my mast, but instead decided to take down most of the mast. It's just too tall and we fear that it's going to be a problem in very high wind, or might be hit by lightning. So now the TV ant is about 16 feet lower. (TV Reception from Rode Island etc is still the same). I'm going to replace the TV ant with something a little smaller and down lower, away from the DPD..
DPD range seems to be staying the same. It's about what I expect this time of the year.. Poor to the north and okay down to Long Island. Thanks for the reply. Funny thing is tonight the coverage is crap. We had a ton of rain and high humidity. Not sure if this is a result of the weather conditions, but targets are remaining withing 160nm. I just looked at the weather radar and there's a lot of rain to the north. Water absorbs microwaves. Heavy snow does the same thing. This Tidbits forecast looks awful wet for the next couple of weeks.. With some breaks.. I hope..